We find that bankruptcy is frequently misunderstood, often considered an option of last resort, and for some, it seems the end of the world. Few people appreciate that the bankruptcy provisions are there to provide relief and to give financially distressed people a fresh start. This case study highlights the benefits of bankruptcy in the right circumstances. In this case, Worrells was appointed as bankruptcy trustees to a person struggling with debt and unsure of their options. This person, let’s call him ‘Bruce’ (to conceal his real name), was a self-employed bricklayer trading through a sole trader structure. Bruce was in his early 30s and this was his first ‘business venture’—before that he had always been an employee. We find that people new to business often focus on the work and struggle to keep up-to-date with accounts, administration, and other compliance matters. And when they were formerly an employee and accustomed to being able to spend whatever amounts hit their bank account—it takes significant discipline to ensure enough is set aside for future financial obligations (such as tax). In the years since setting up as a sole trader, Bruce’s gross annual income averaged around $85,000 p.a., some $70,000 after tax. When starting out, his motivation to be proactive with tax lodgements was high—amounts due were paid on time. But this slipped as life got in the way and he fell behind on his tax lodgements and creditor payments. Starting a family exacerbated the position with mounting day-to-day living expenses. Bruce found himself with a string of unpaid debts and numerous debt collectors were calling. This case is no different to dozens of other cases we see each year. A large part of his income was also being used simply to try to maintain the unsecured liabilities. Living this way, Bruce and his family were emotionally and mentally stressed. Continuing to run his sole-trader business. So, let’s discuss these concerns first. 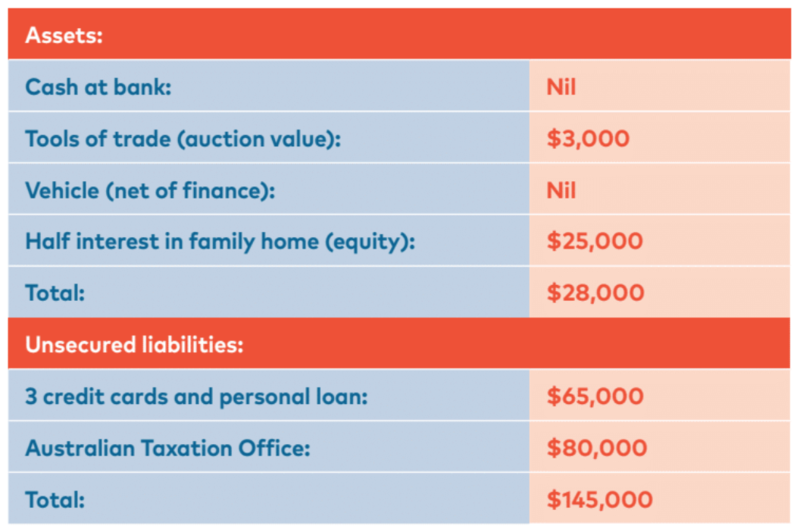 The family home is the single, biggest asset most people own, it has a lot of sentimental value and is without doubt, the greatest concern for most people facing personal insolvency. As a general premise, when a person becomes bankrupt, their trustee becomes the owner of any share in a house or property they own. This means the trustee has control over the property and their task is to realise any value in the property. The co-owner can agree with the trustee to sell the property. In this case, Bruce’s wife agreed to purchase the bankrupt’s interest in the home. She is now repaying the agreed sum over a set period. The family therefore continues to own and live in the property. They must disclose their bankruptcy status to any prospective credit provider if the amount involved exceeds the prescribed limit—currently $5,613. In our case, Bruce continued trading his sole trader business—with little to no impact—by the bankruptcy status. Bruce owned a Holden Ute that was subject to finance. We found the vehicle was valued at approximately $25,000, with the payout on the finance being about the same value. As there was no surplus ‘equity’, we took no action to sell the vehicle. The options for Bruce were then to either surrender the vehicle, or if he wanted to continue using the vehicle, he could continue to make the monthly repayments to the financier. In our case, the latter option was chosen. Bruce owned around $3,000 in tools of trade used in his sole trader business (at auction value). While all assets technically vest in a trustee upon their appointment, and are therefore available for realisation, there are several exceptions to this vesting rule. One exception carves out tools of trade—protecting bankrupts from losing these tools provided the value is under the prescribed limit (currently $3,700). In this scenario, we took no action to sell the tools of trade given their value. Throughout the bankruptcy period, a bankrupt’s income is monitored and if it exceeds prescribed thresholds, the bankrupt must make contributions into the bankrupt estate. 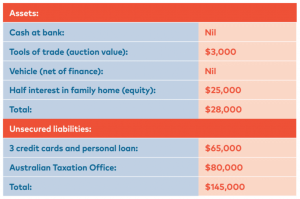 Where the bankrupt operates a business, as was the case here, appropriate business deductions are subtracted to determine the true net income level (after tax). In this scenario, with three dependents the current after-tax threshold applicable is $73,705.63. Bruce’s income is not likely to exceed this income limit and therefore its likely Bruce won’t be liable for any income contributions—this means that all income earned is his to spend. All unsecured creditors (the ATO, and financial institutions for the three credit cards and a personal loan) were dealt with through the bankruptcy and shortly following our appointment, Bruce stopped receiving calls from these creditors and its debt collectors. All these debts will be extinguished through the bankruptcy and he will have a fresh start. Given it’s likely he won’t be liable to pay income contributions, the family now has a greater disposable income—previously a large portion of the individual’s income was used to juggle creditor repayments. As this case shows, in the right circumstances a bankruptcy can be a powerful tool to provide financial relief, and in fact, creates little impact on a person’s business interest and lifestyle. We encourage you to contact your local Worrells office if you or a client of yours is struggling with debt and would like to know their specific options and its effects.